This is a collection of speeches and short articles from Dave Sim, Neil Gaiman, Frank Miller, and more, all in support of the CBLDF. They're interesting, especially if you have any interest in the intersection of the the first amendment and comics, this is a good primer, albeit a bit dated in some aspects. Miller's speech especially, with its focus on the move of Marvel to commissions over work-for-hire, hasn't dated particularly well, although it has some interesting points, especially about the 50's Wertham hearings and the Comics code's origins. The longest speech was from the ACLU head and explains the legal underpinnings of the First Amendment in relation to comics, which gets a bit dry. Neil Gaiman's section is short but sweet, and the biggest laughs I got were from reading the text of the Comics Code, and comparing it to what gets written these days. Overall it's a useful historical document with some important advice and information. I Got this as part of a Neil Gaiman's rarities Humble Bundle 2016.For a collection of speeches on Free Expression, not the most attractive subject, this was surprisingly entertaining. Gaiman's contribution is minor. 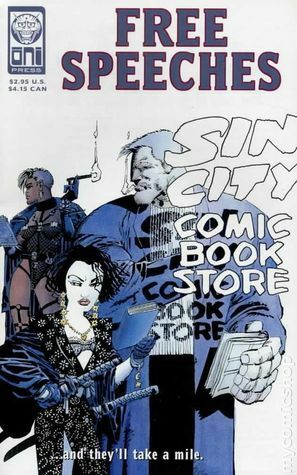 The main speech, from Nadine Strossen of the ACLU (American Civil Liberties Union, I had to google this), discusses how and why the first amendment applies to comics and to self-imposed ratings and is as relevant today as it was back in 1998. The rest have varying levels of relevance. The quotes on every page are well chosen and I actually wrote one or two down for future reference. The illustrations are a nice addition. Overall, three stars out of five, not a bad read. This is a compilation of speeches made by comic book writers talking about the Comic Book Legal Defense Fund. If I was more passionate about comics I may have read all the speeches from start to finish, but as it is I just casually like the occasional comic, so instead I skimmed through this book. I read the introduction to get a sense of the whole thing, and I really support the whole idea of CBLDF (which is why I bought the first Bundle). Not really a fan of comics s i didn't particularly care for this one. It was interested to see how people have attacked and defended comic book artists in recent history tho.